This review first ran in the Sept. 28 edition of The Hamilton Spectator. Here are two ways to convince more Millennials to move to Hamilton. Rebrand our Ambitious City as the Useful City. And have drones fly over Walmart when shooting highlight reel videos of Hamilton. Here’s why. Today’s Millennials are tomorrow’s pragmatists and Walmart shoppers. Time-squeezed Millennials who got hit hard by the Great Recession will embrace pragmatism because their lives are about to get even more complicated, stressful and expensive. By one count, a quarter of Millennials are already parents. As more of them become moms and dads, they’ll define family life for the next 30 years. Look for Millennials to raise kids blessed with an unprecedented sense of individual tolerance and social responsibility. Millennial moms and dads will lead the charge in setting new standards for health and nutrition and new expectations when it comes to the quality and purity of the food that they serve to their families. As parents, they’ll be less involved in civic, political and social causes and they’ll become more conservative. Millennials will also discover what every parent knows all too well. 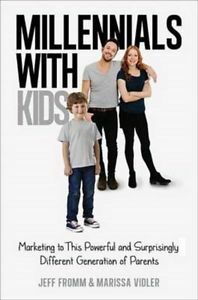 Kids change everything, priorities radically shift and household expenses can go through the roof. While 20-somethings may swear they’ll never venture beyond downtown and step foot in a Walmart, that pledge of unallegiance is subject to change. In a recent survey of top 10 brands, Millennials ranked Walmart dead last. Walmart climbed to the fourth spot among Millennial moms and dads. Why the jump in popularity? Yes, some Millennial parents will drop a small fortune on brands that deliver unique, personalized experiences and high quality for their kids. They’ll shop and splurge at Whole Foods and Pottery Barn. Yet they’ll also look to balance the family finances by saving money on other household purchases. So let’s welcome Millennials to the Useful City. Let’s tell them why we’re the best and easiest place to raise a child. And let’s show them that we have Walmarts to go along with our waterfalls, parks and downtown arts scene. This review first ran in the Sept. 14 edition of The Hamilton Spectator. You went to school, got a job in your field and built yourself a rewarding career. You’ve climbed to the top rungs on the ladder of success. You’ve got fortune and fame. You’re a mover and a shaker. You’re also bored out of your mind. Every day’s a grind. You’re exhausted at the end of the week and dread Monday mornings. Instead of recharging your batteries, vacations bury you in melancholy. A promotion and bigger paycheck won’t pull you out of your funk. You’re ready to hit the reset button yet have no idea what comes next. You’re not keen on doing more of the same for a different employer with a new cast of colleagues. You keep doing what you’re doing because there are mouths to feed and a mortgage to pay. You’re the breadwinner. There isn’t three months of salary parked in a savings account. You’ve got a generous pension plan and full dental and medical coverage. You feel guilty because jobs like yours are tough to get. Walk away and there’s no coming back if you come to your senses and realize the grass isn’t greener. You’ve been told to never quit a job until another one’s lined up. You’ve been taught to be ambitious and always strive for bigger and better. Successful careers move on an upward trajectory. Voluntarily moving down a rung or stepping off the ladder is a career-limiting move. Forget knowing the colour of your parachute. You don’t even have a parachute. 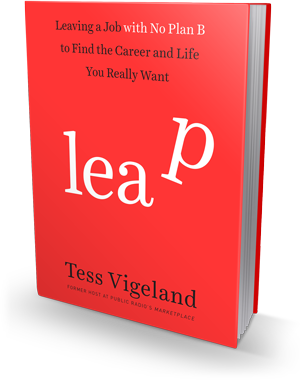 Jump anyway and sew it while you’re in mid-air, says the author of Leap: Leaving a Job with No Plan B to Find the Career and Life You Really Want. Tess Vigeland speaks from experience. She walked away from her dream job hosting Marketplace on National Public Radio in 2012 without knowing what to do next. “This is a story about coming to grips with the idea that you don’t have to be defined by your work,” says Vigeland. Vigeland tells stories about professionals who’ve lept. Some landed safely in a better place while others were still in mid-air years later and a few suffered hard landings. Leap isn’t an instruction manual. You won’t find 10 easy steps to walking away and starting over. But it’s a must-read for anyone who knows it’s time to move on but doesn’t yet have the courage to leap without a net.